Sir Martin said on receiving the award, ‘I’m delighted to accept this award recognising the formation of the international Disaster Monitoring Constellation now in its 10th year. The constellation is unique in its use of advanced microsatellites providing rapid response Earth imaging and has become an immense humanitarian asset; showing that in the competitive world of space, diverse countries can work together for the good of mankind’. The DMC was conceived in 1998 and formally proposed in 2000 following the Vienna Declaration on Space and Human Development, which called specifically for the implementation of an integrated, global system to manage natural disaster mitigation, relief and prevention efforts through space activities. At that time, SSTL had lowered the price tag of Earth Observation satellites to the point where governments and organisations throughout the world could own an independent satellite. Sir Martin Sweeting and his team at SSTL recognized the potential of a multi-satellite constellation using these advanced small satellites to address disaster monitoring from space. 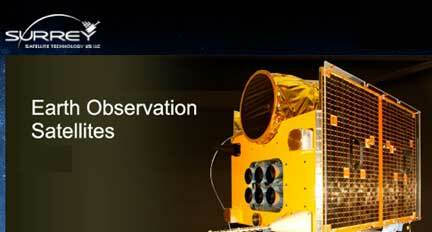 SSTL established the Disaster Monitoring Constellation with support from the former British National Space Centre (BNSC). The first satellite, AlSat-1, was launched in 2002 and was soon joined by UK-DMC, NigeriaSat-1 and BILSAT-1 in 2003 to form the original four-satellite constellation. 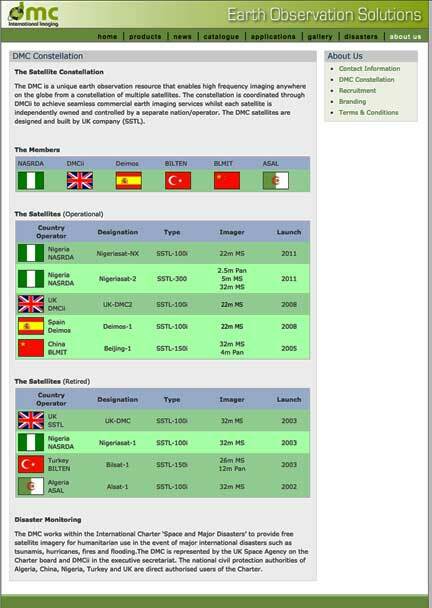 The constellation has continued to evolve and innovate and today there are currently five active members of the DMC; U.K. (SSTL), Nigeria (NASRDA), Algeria (ASAL), China (BLMIT) and Spain (Deimos) that each own an independent satellite, but pool their resources for disaster and commercial imaging. The SSTL subsidiary DMC International Imaging Ltd. (DMCii) was established in 2004 to coordinate constellation imaging for humanitarian and commercial needs in partnership with the constellation members. DMCii works with the world’s Space Agencies and the United Nations (UN) under the International Charter for Space and Major Disasters to provide multi-spectral optical imagery during natural disasters and has assisted relief efforts for disasters such as Hurricane Katrina in 2005, the Wenchuan earthquake in 2008 and the Japanese Tsunami of 2011—it has responded to more than 170 Charter requests for disaster imagery. The cost effective DMC small satellites and shared infrastructure provided a springboard for countries such as Algeria and Nigeria to establish their national space programmes and harness Earth observation to map and monitor resources and their environment. By working together the constellation provides the ability to image any point in the world on a daily basis, which has proved equally valuable for disaster relief, agriculture and precision farming, or detecting illegal logging in the Amazon rainforest.